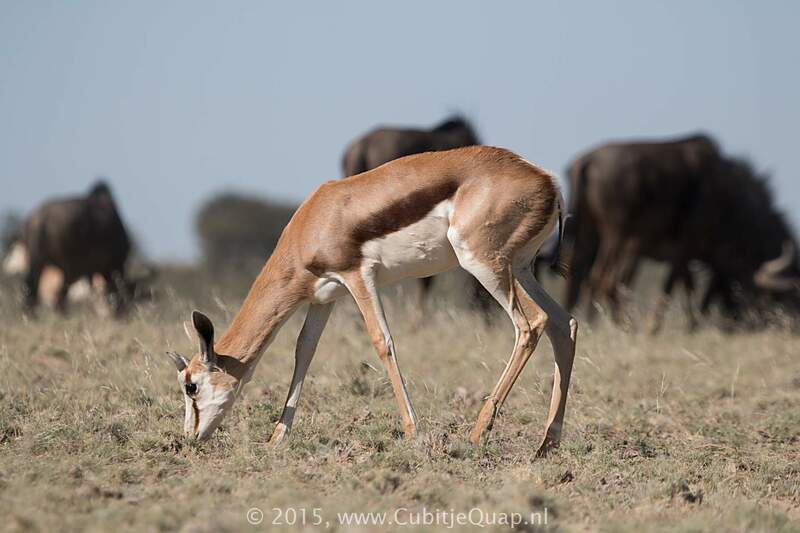 Ewe: Shoulder height 75 cm; tail 25 cm; mass 37 kg; average horn length ? 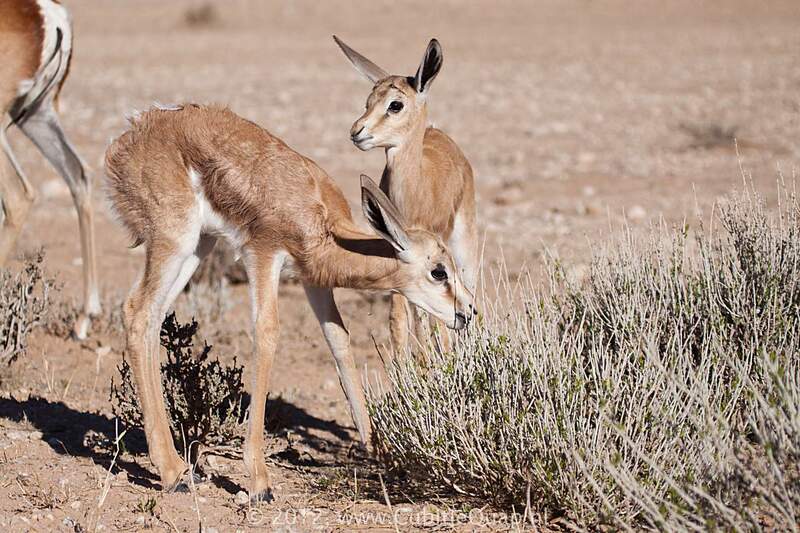 Hindquarters of this distinctive antilope appear to be slightly higher than shoulders. 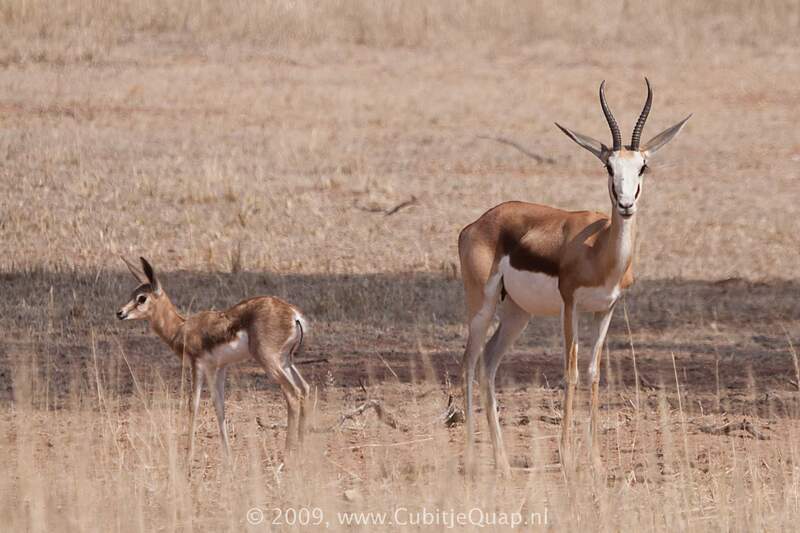 Dark red-brown band along flanks separates fawn-brown upperparts from white underparts. 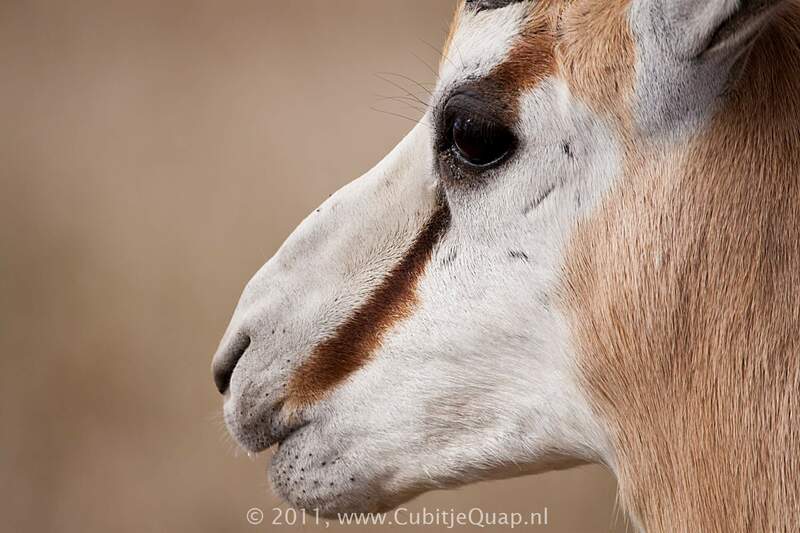 Head is white with a brown stripe running through eye to corner of upper lip. 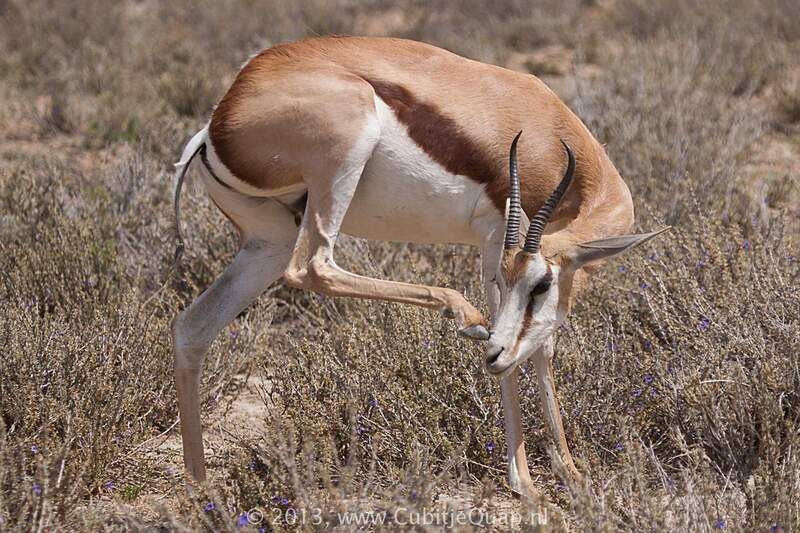 A large white patch on rump is bordered by brown stripe. 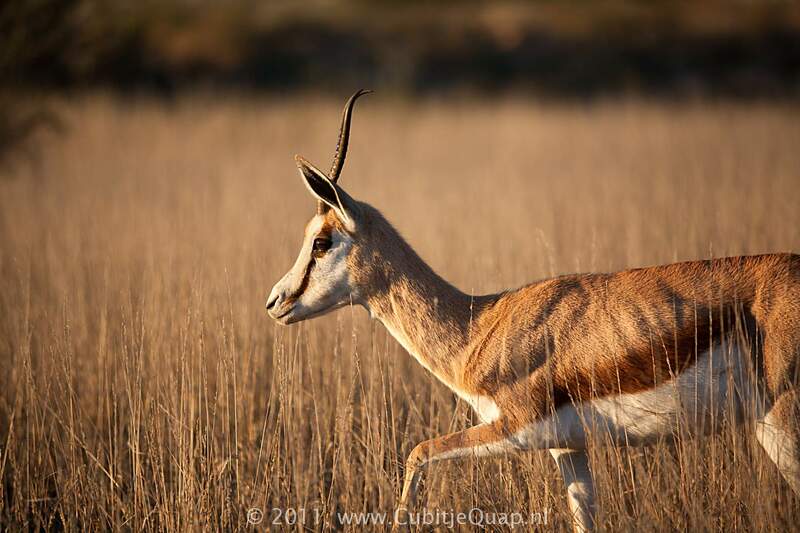 There is a long-haired, white dorsal crest extending from the midpoint of the back to the rump; this is normally seen only when the crest is erected, for example during 'pronking'. 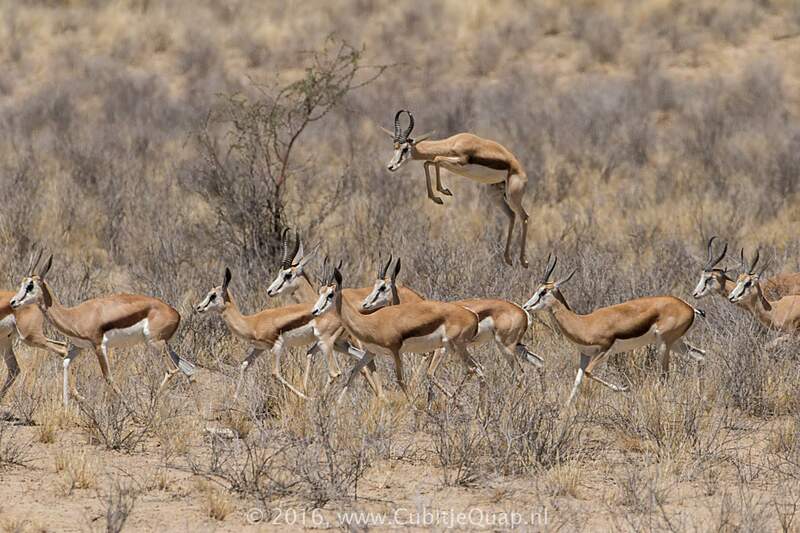 The pronk is a jump perfomed with stiff legs accompanied by arching of the back. 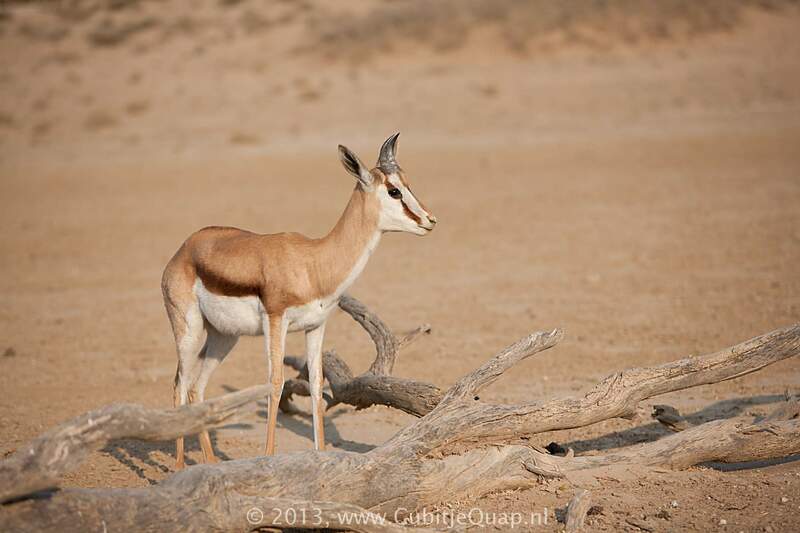 Tail is white with tuft of black hairs at tip. 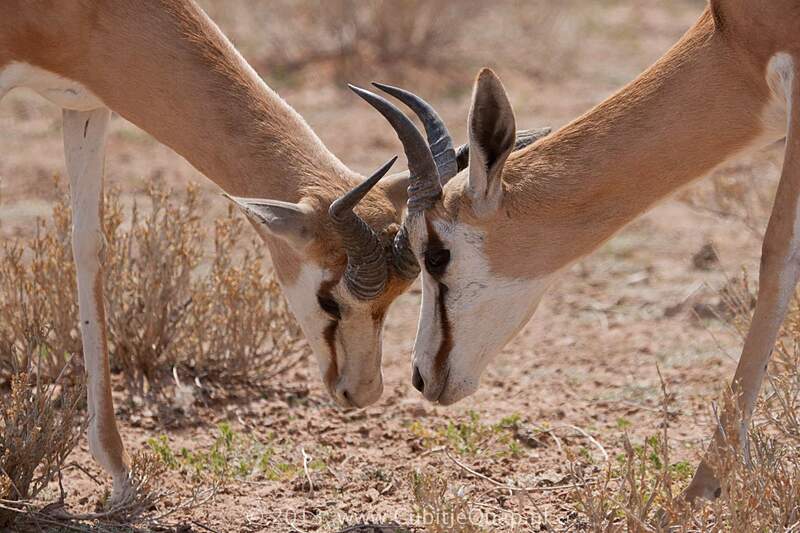 Both sexes have heavily ridged, lyre-shaped horns but ram's are thicker and longer. 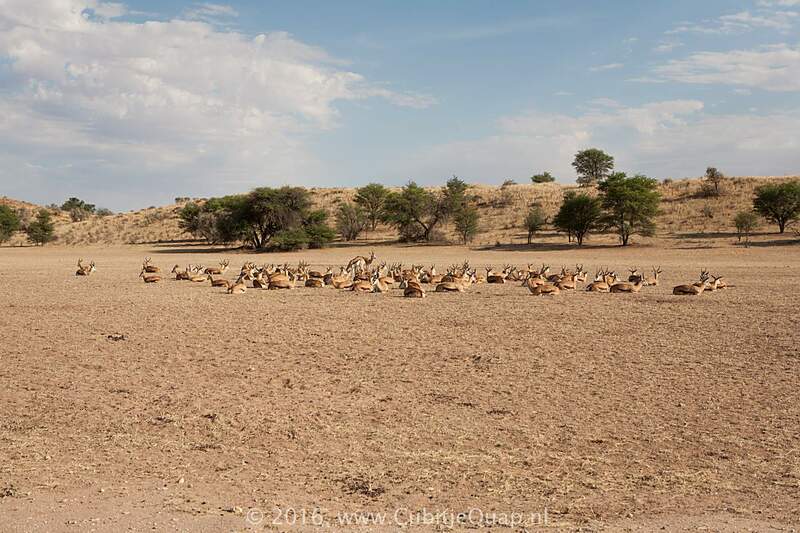 Open arid plains. 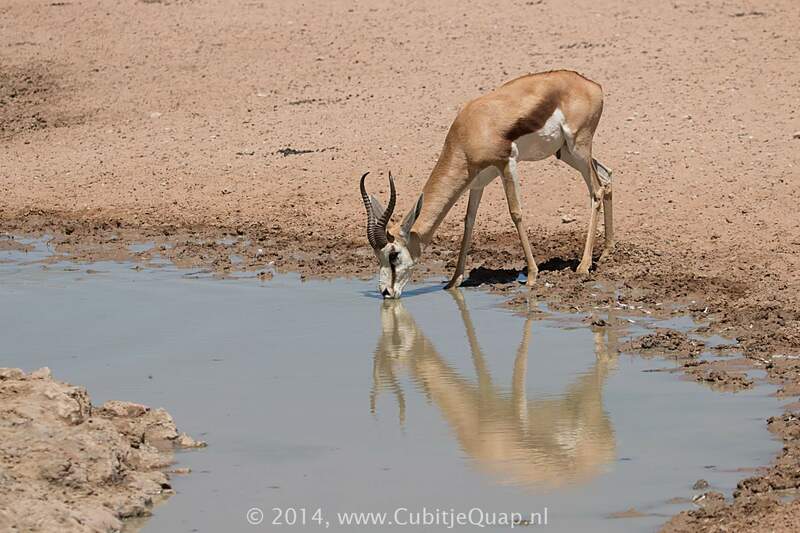 Surface water is not essential. 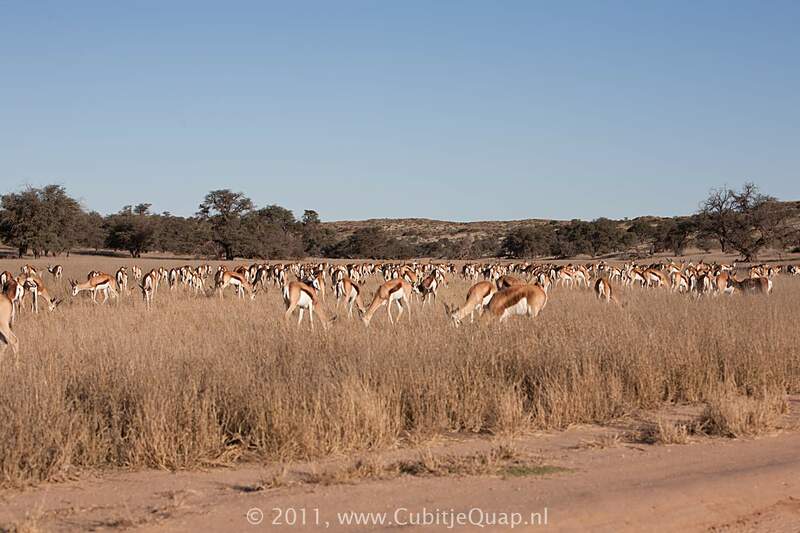 Normally in small herds but when moving to new feeding-grounds may congregate in herds of many thousands. 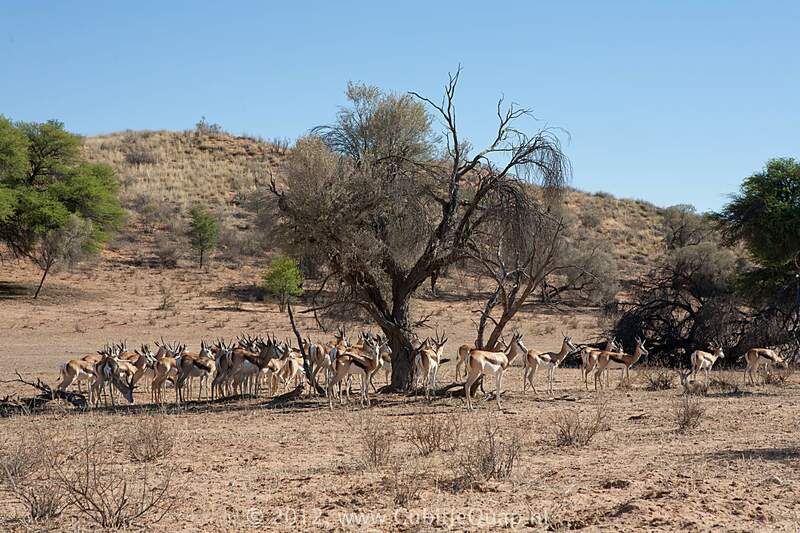 Small herds may be mixed of consist of rams only; solitary rams are frequently encountered. 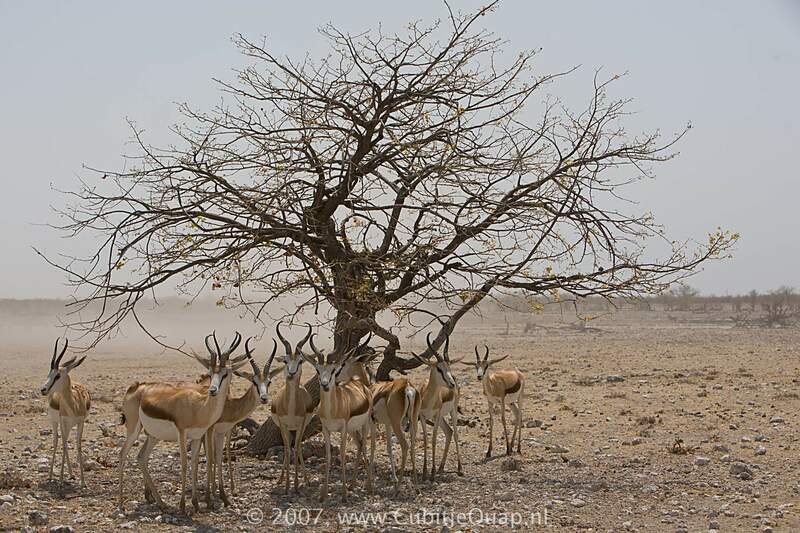 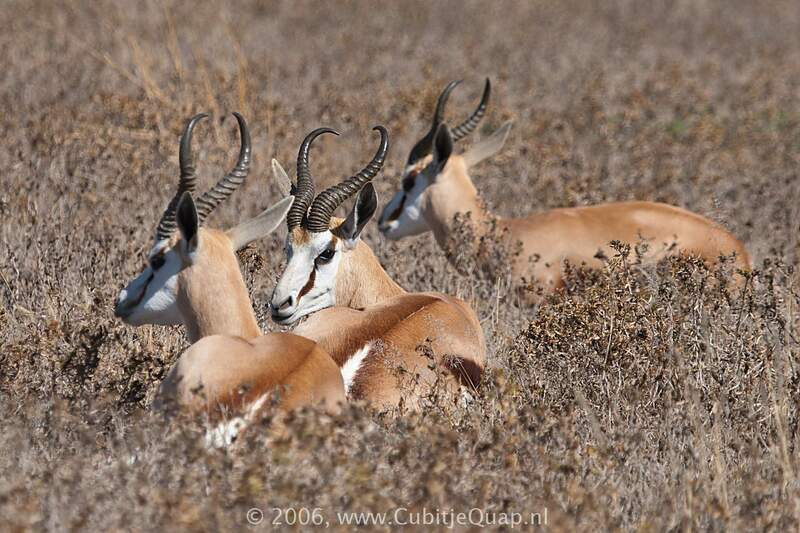 Sprinbok rams are territorial and in rut herd ewe groups; they do not, however, remain in their territories throughout the year. 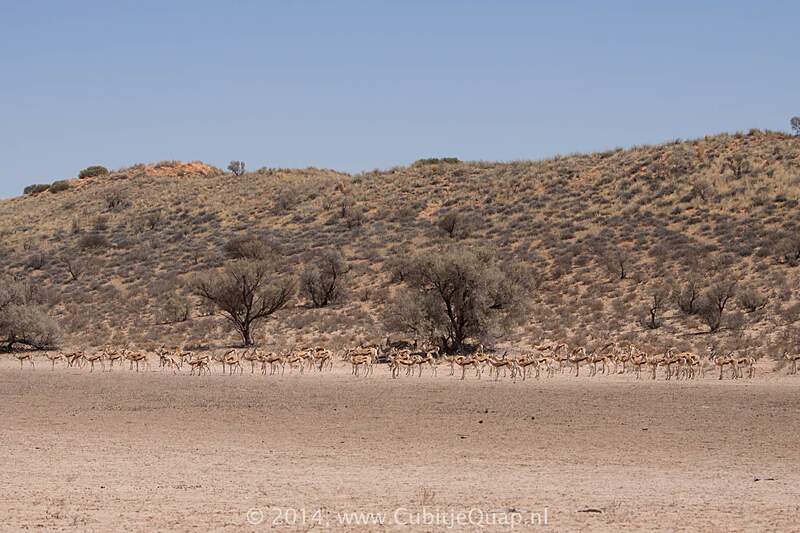 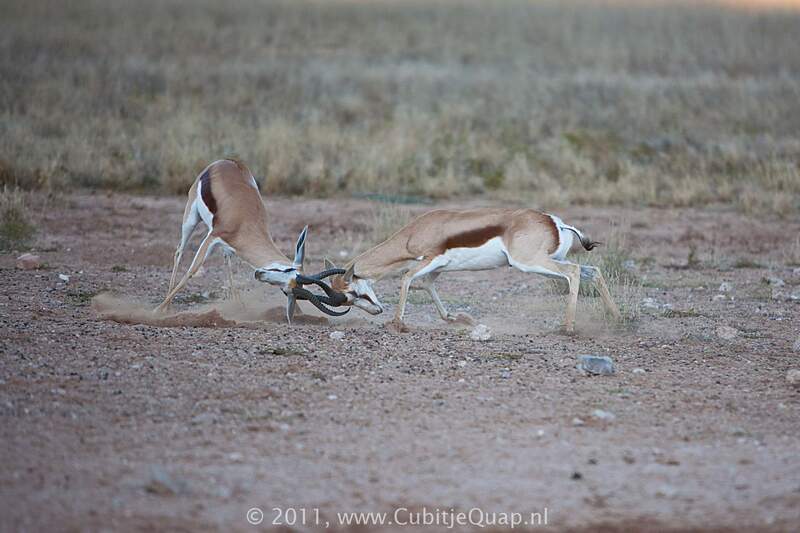 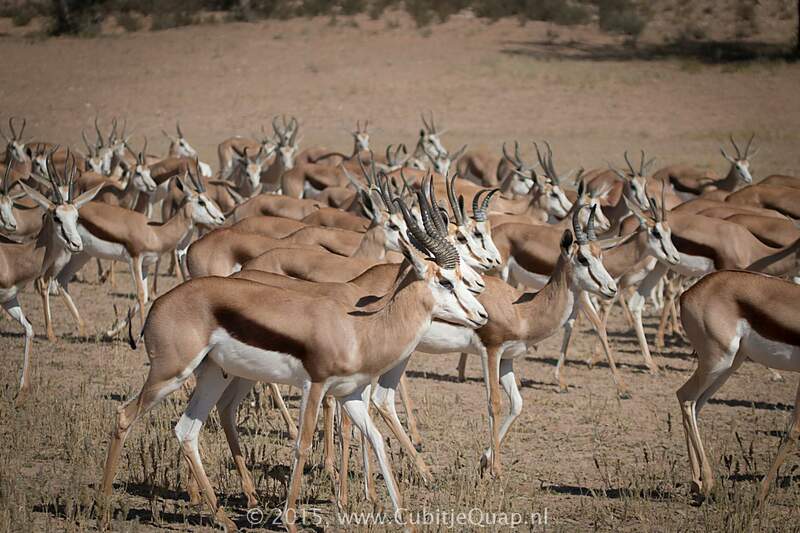 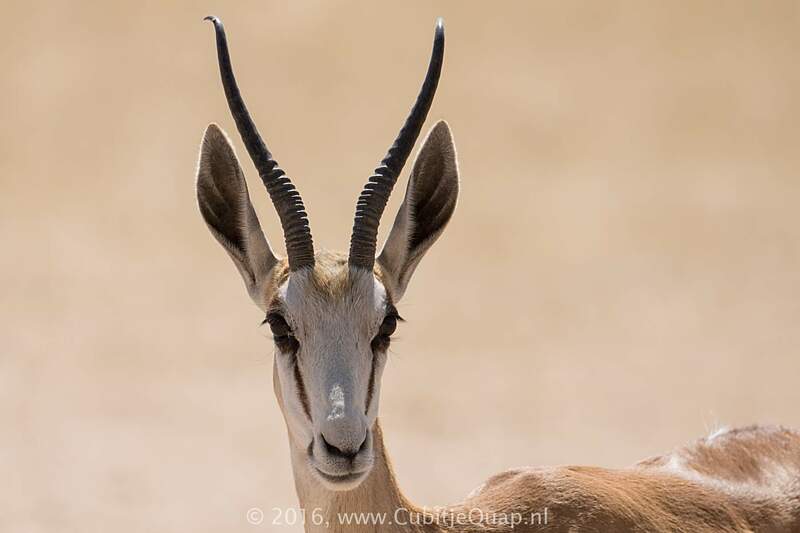 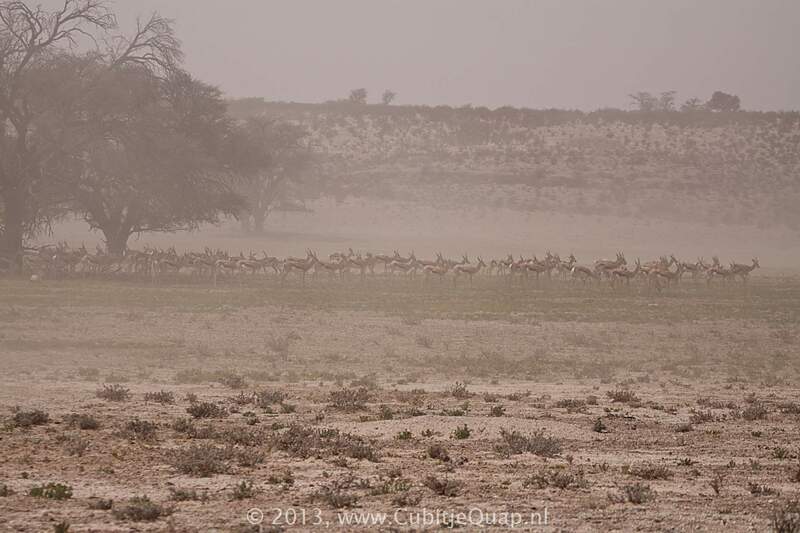 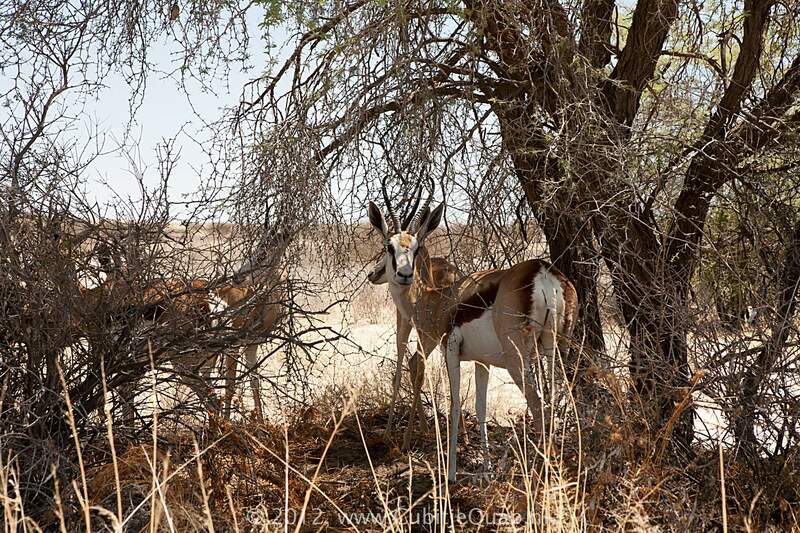 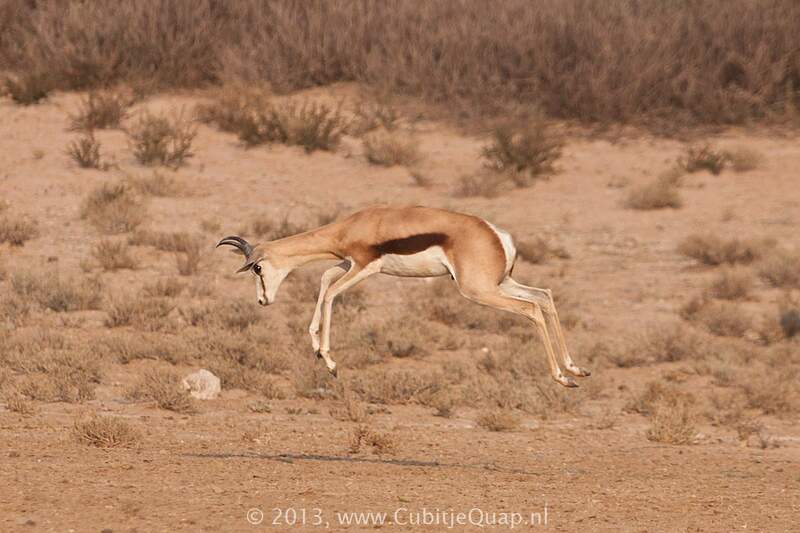 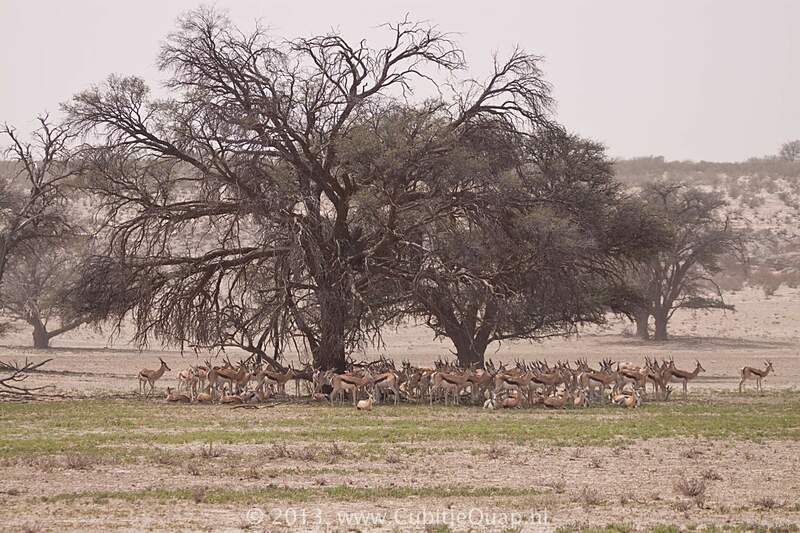 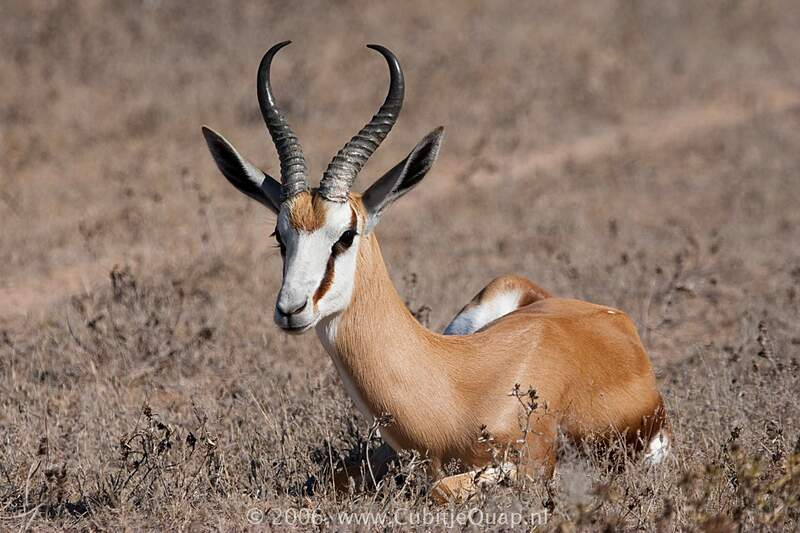 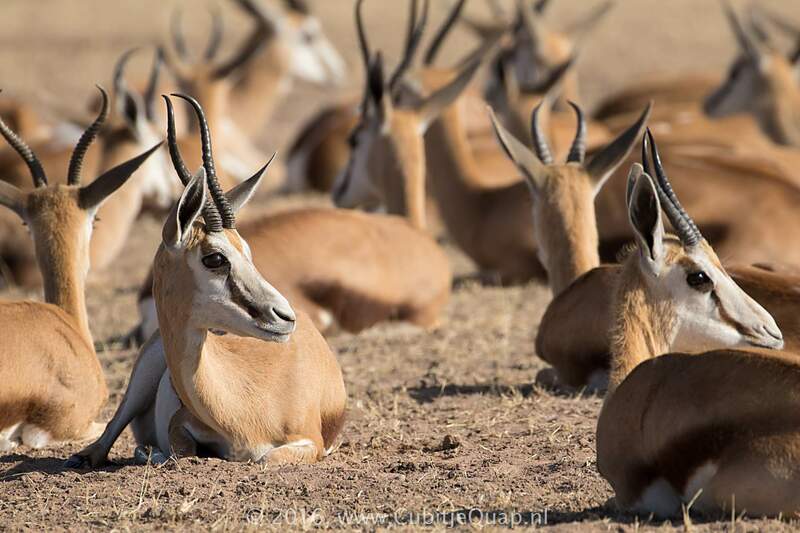 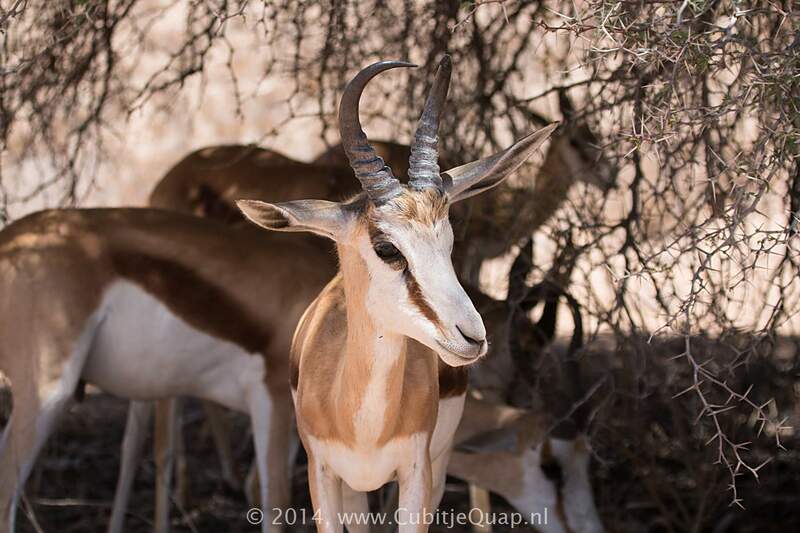 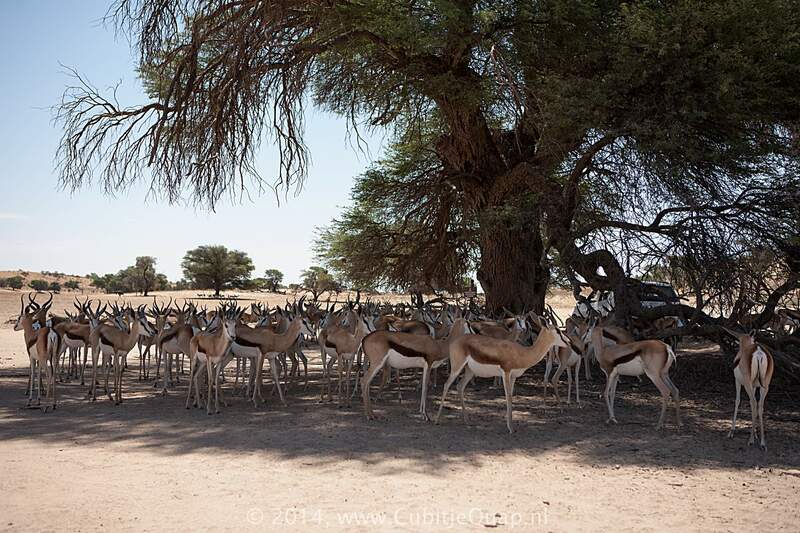 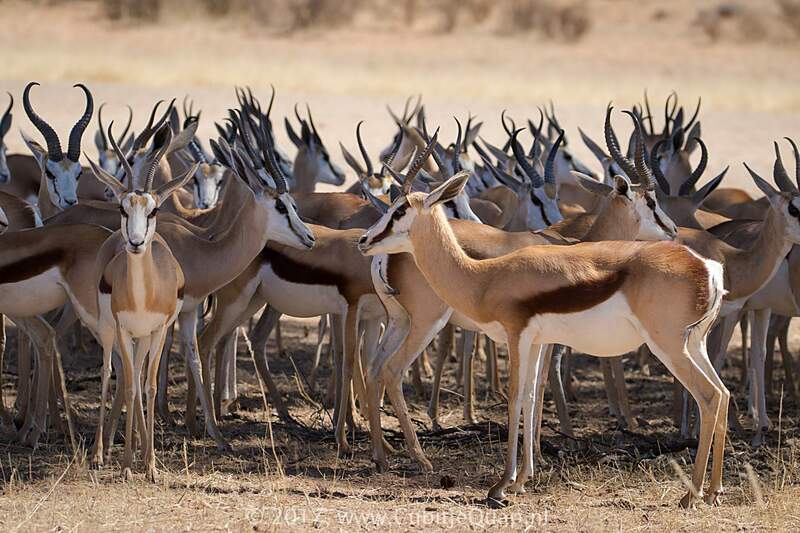 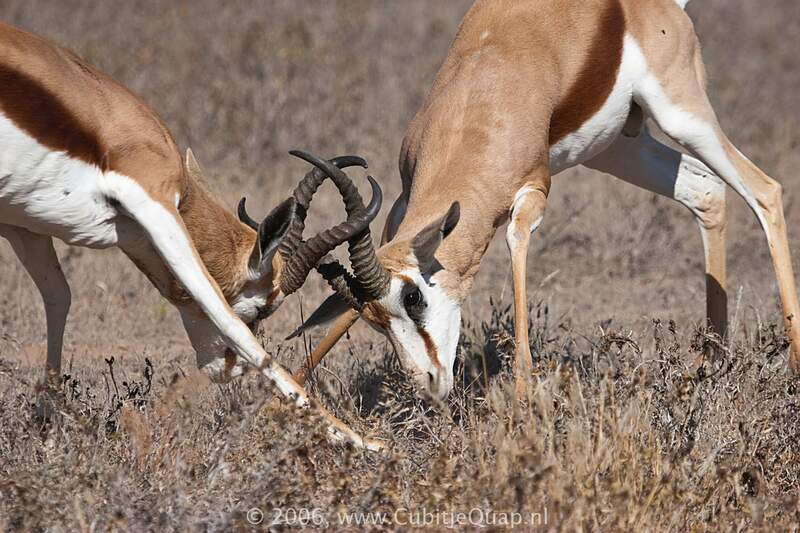 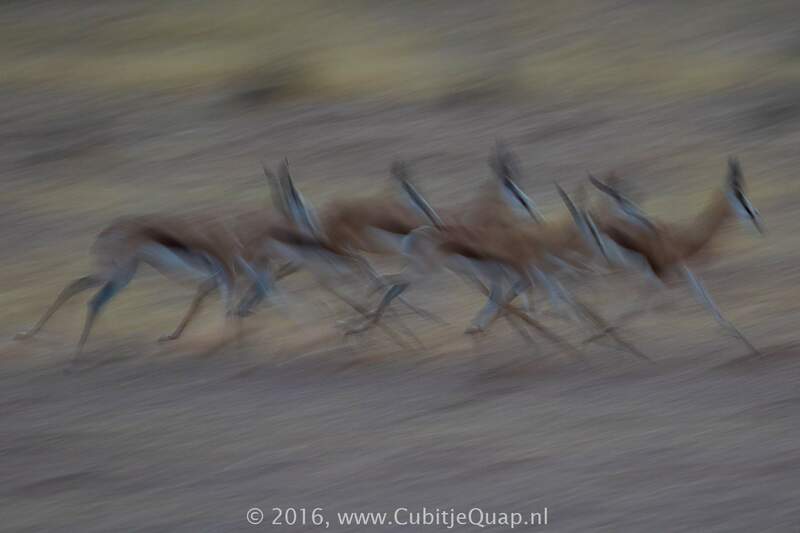 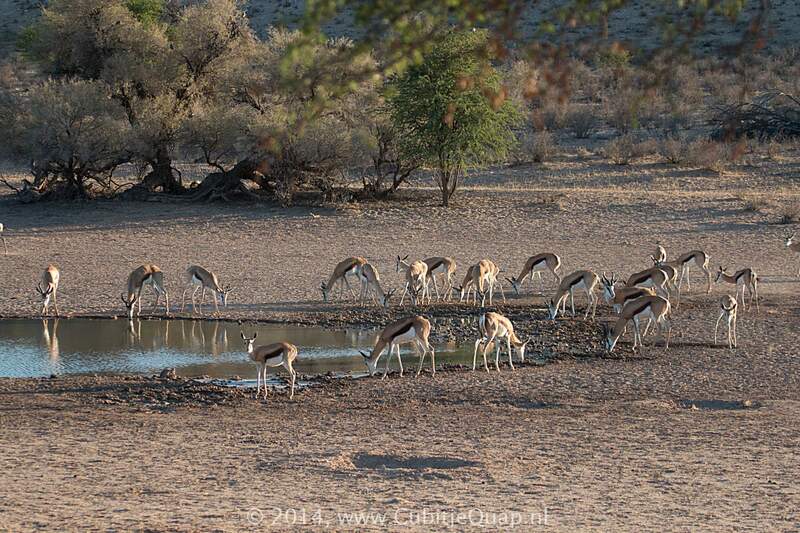 Springbok are active during the cooler daylight hours but also partly at night. 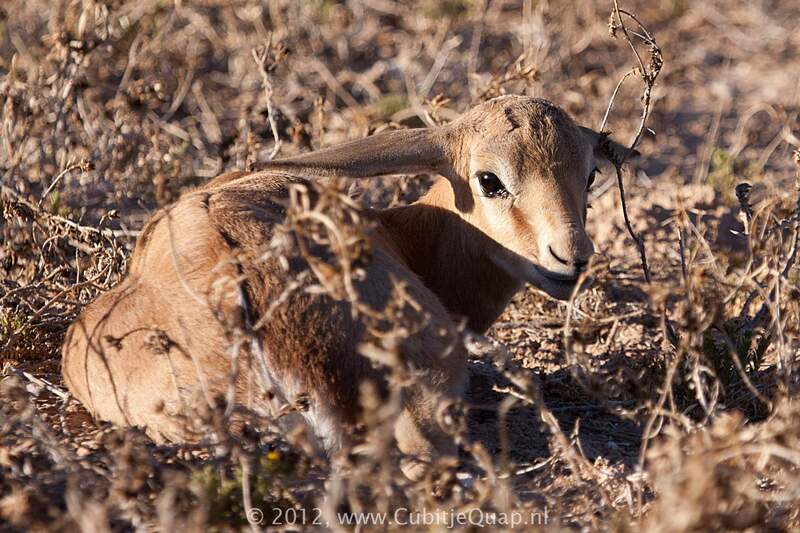 Grass and browse; will dig for roots and bulbs.